In 1822 Gideon Mantell, a doctor from Lewes, East Sussex, described a fossil tooth which his wife had found by the side of the road in Cuckfield, West Sussex. This tooth was the first dinosaur fossil in the world ever to be identified. For the very first time people began to realise that creatures as large as dinosaurs had once existed. Gideon Mantell went on to search for, discover and identify many other dinosaur remains. Visit UKGE - the online geology supplies superstore - and see what dinosaur fossils are available at the moment. 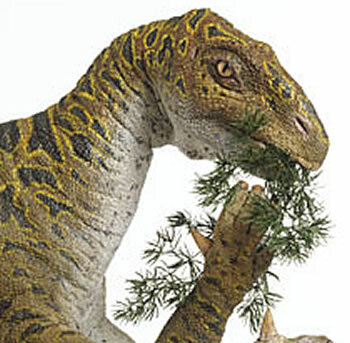 What did Iguanodon look like? When were dinosaurs discovered, and by whom? Read about famous dinosaur hunters, and the remarkable discoveries they have made. Find out when the various species of dinosaur were first discovered, and where. Visit the online bookshop and for recommended books on dinosaur hunters and their discoveries through history.